Cut the limes in half. Scoop out the insides. Add the limeade to a saucepan, sprinkle the gelatin over the juice. Let it sit for 2 minutes. Heat the limeade over low heat, stirring, until the gelatin has dissolved, about 5 minutes. Stir in the tequila, triple sec, and sweetened lime juice. 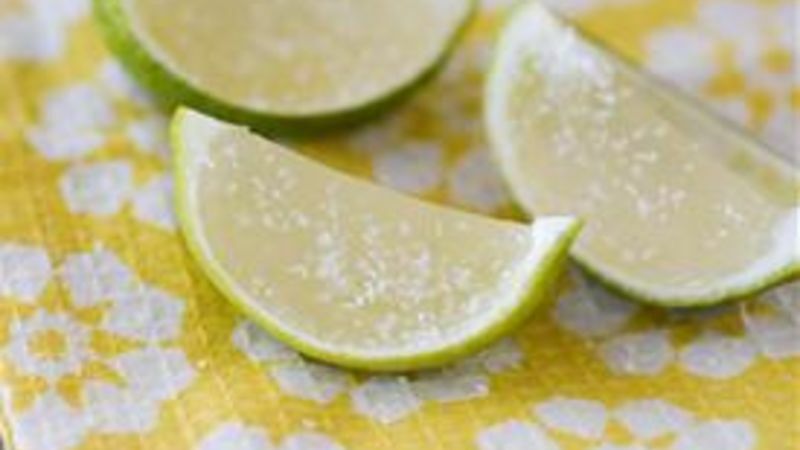 Pour into the lime halves. Cut the limes into half, sprinkle with salt, and serve. It’s the weekend (or maybe it’s Monday) and nothing says weekend (or Monday) quite like a margarita. But sometimes you’re drinking with other people and need to make margaritas for a crowd. Enter: margarita jello shots. These jello shots feature everything you can’t do without in a margarita like triple sec, tequila and a lime. In fact, the margarita is served right inside the lime wedge! You can of course serve the shot in a plastic cup the traditional way, but if you serve them in the lime, they’re guaranteed to be the talk of the party! If you’re short on time, you can even buy margarita-flavored gelatin at the grocery store. Just make sure to check online or call the store to check availability. We’ve got all your jello shot needs from recipes to a complete guide on how to make ‘em and perfect ‘em.